One of the two pieces of pottery I've created in my lifetime. Recently during a visit to the dentist’s office, my hygienist told me that she likes to write but when she tries to put her ideas on paper, they come out a jumbled mess. I told her that I understood – and I feel the same way. Staring at me like I had just told her that I performed a root canal on myself without local anesthetic, she compelled me to explain. “That’s how I feel about art,” I told her. I can picture it in my head, but when I put pen to paper nothing more appears than a dizzying array of colors splattering on the page. Maybe some art gallery in Manhattan would praise me as an artistic genius, but I would know the truth: My creativity doesn’t extend to artistic expressions of visual beauty. The only form of art that I can sort of grasp is that of pottery. I’ve only made a couple of pieces in my life, but I find the whole process fascinating. At least, the molding and shaping part is interesting to me. Everybody can have fun getting their hands dirty with wet clay. 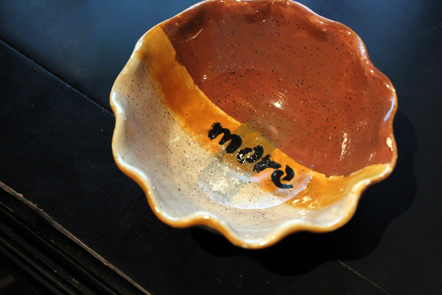 I think what I like most about pottery is that it can become anything – even after it’s become something else. Just add a little bit of water. It can be a big lump of clay that stays that way. Or it can be shaped into a utilitarian piece of dishware. Or it can become so ornate that it finds its way to a palace. Maybe the potter knows when he starts or maybe he doesn’t. But in the end, the final product is a result of the clay’s pliability. If I am honest with myself, I admit that I am far from a palace piece. I’m lucky if I’m even utilitarian – at least, that’s how I feel sometimes. Can God use this? Am I nothing but a big lump of clay? But instead of resisting God’s molding hands, I relent. I allow the uncomfortable pressure and kneading to begin to shape something beautiful, something I’ve yet to conceive that I could become. Around and around I go, wondering if this process will ever end or if I’m forever destined to spin on the potter’s wheel. When I realize that what I look like matters only to One, I stop caring about how long it takes. Spin me around a million times if that’s what it takes. I just want to be a piece that creates a spark in His eyes when he holds me up. I would love to adorn a palace … or hold bread for the hungry in a soup kitchen. Whatever He wants to shape me to be, let me always be pliable in His hands.